You can explore the city if you’d like, but there isn’t anything exciting to find. There are new weapons, armor, and spells available, but hold off on making any purchases; There is a better opportunity for equipment coming up shortly. When you are finished in Paloom, exit the city and board the boat for an automatic ride to Poft. I assume he’s talking to Maria, but either way, I’m throwing him into the drink. There isn’t much do to in Poft. 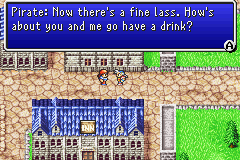 You can visit the town’s Pub and speak with this game’s Cid, but we don’t require his services just yet. Much like Paloom, there are shops here, but nothing worth buying. If you forgot something in Paloom or Altair, you can purchase tickets and return, but it’ll cost you another 32 gil there and back again. Exit Poft and travel north until you reach the mountains, then turn west until you run into the town of Salamand. There is finally some equipment and spells worth buying in Salamand! For my group, this means purchasing a Long Sword, Battle Axe, and three complete sets of Bronze Shields, Helms, Armor, and Gloves. I don’t typically buy anything for Minwu, but rather equip him with the leftovers from the trio. If you have gil to spare, the Life and Teleport tomes will be useful but are necessary just yet. Once equipped, visit the house in the northeast corner of Salamand and speak with Josef about Mythril. It seems the men of Salamand are being held as slaves in Semitt Falls, and Josef won’t help you until they’re free. To reach Semitt Falls, leave town and head straight west, then south once you reach a lake. Use your Canoe to follow the nearby river to the east to reach Semitt Falls. Finally! Our first dungeon! The layout is pretty simple, and the enemies aren’t too difficult. 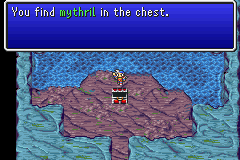 The goal is to reach the treasure chest containing Mythril located in Semitt Falls B5. 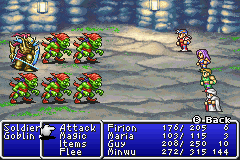 As you proceed through Semitt Falls, you might notice another peculiarity of the Final Fantasy II battle system: There are enemy “rows”. Enemy formations, like the one pictured here, require that you defeat the enemies closest to your party before you can target those further away. At least with melee attacks. If you are using magic, you can target whomever you please. If you come across Green Slimes, they are incredibly vulnerable to elemental magic, so don’t be afraid to use some MP to finish them off quickly. You can “multi-target” most magic in Final Fantasy II by pressing up (when targeting an enemy at the top of the screen) or down (when targeting an enemy at the bottom of the screen). You can usually defeat any number of Green Slimes with a single, multi-targeted spell. Be wary of the company you keep, for they are a reflection of who you are. Yeah, I just called you a Goblin. As you make your way through Semitt Falls, you’ll notice that there are a lot of doors. 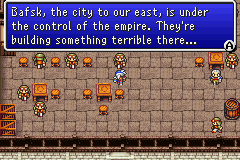 The vast majority of doors in Final Fantasy II dungeons lead to an empty room with a forced enemy encounter. To save my sanity, I have not mapped these rooms. If there is something exciting behind a door, I will mark in clearly on the dungeon maps. There are two “bosses” within Semitt Falls, and depending on your stats, magic may be your best means of damaging them. Be sure to keep some MP in reserve! On floor B3, you will meet Paul the thief and Josef’s daughter. On floor B4 there is a chest guarded by a Land Turtle. The Land Turtle is no joke, capable of dealing damage in the 120-140 HP range. If someone should take a hard hit, Minwu has Life and Cure magic to get them back on their feet. The Land Turtle is susceptible to Ice magic, so make use of Blizzard to take it out quickly. 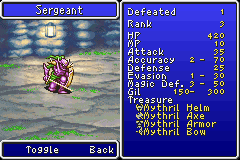 You will find the Sergeant, the boss of the dungeon, on B5 guarding the Mythril. In all honesty, the Land Turtle is more difficult than the Sergeant. The Sergeant will attack single party members for 50-80 HP of damage. It shouldn’t be too hard to keep up with, especially if you have Minwu multi-target his Cure spell on the entire party. Though the Sergeant doesn’t have any elemental weaknesses, his high defense means that magic may be the best option for attack. The Sergeant’s 420 HP can take a long time to chew through with only melee attacks. I hope you heeded my advice and saved some MP! Once you have defeated the Sergeant, open the nearby chest to obtain Mythril. Finally! Use a Teleport spell or walk back to the entrance of the cave and head all the way back to Altair. If you need a reminder (I know I always do), travel west from Semitt Falls until you reach the lake. Head north around the mountain spur and back east to Salamand. Journey east from Salamand until you pass another mountain spur, then head south to Poft. Purchase a ticket to Paloom. Finally, head southwest to get back to Altair. Speak with Hilda and show her your Mythril using the “item” command. She will tell you to take it to Tobul, the old man standing in the weapon shop. 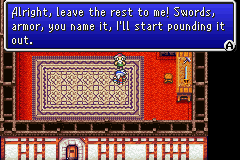 After giving the excitable Tobul the Mythril (using the “item” command again), he will smith some Mythril weapons. Purchase what you need from the new weapons vendor, return to Hilda, and ask her about the Dreadnought. She will tell you about a double agent working in Bafsk and send you to speak with him. To get to Bafsk, head back to Poft via Paloom. You can walk to Bafsk from Poft, which is located to the east, then south. Or, if you’re lazy like me, you can fly Bafsk via Airship by talking to Cid’s companion. The cost of the Airship flight is 100 Gil.